Adrienne Rich. Photo copyright by Robert Giard. There are some touchstone texts that seem to be always current, always resonant with wisdom, always “present” with us, whatever the year and however much the political and/or personal landscapes may have changed. 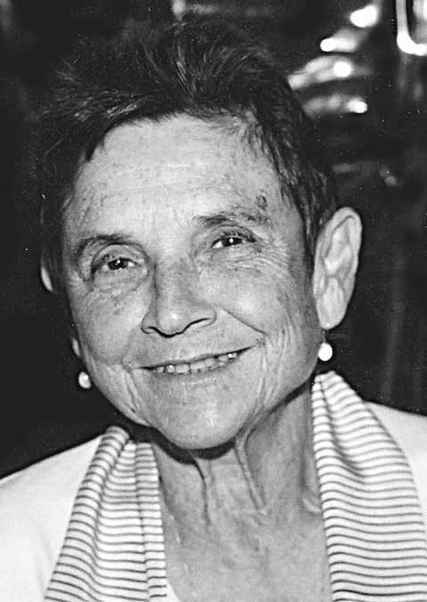 Many of the essays of Adrienne Rich (1929-2012) are such touchstones. I first encountered the transformative work of this American poet and essayist in graduate school, in her prose collection Blood, Bread, and Poetry, in which she declares (with Audre Lorde) that poetry is not (and poets are not) superfluous, but as necessary and nourishing as food and air to the person—the people—we might be and become. Poetry is communion and it is frontier—the meeting of the other and the self. Jacket for St Brigid Press' edition of Adrienne Rich's essay, printed letterpress on Thai mulberry "water drops" paper. One of Rich’s essays, “Permeable Membrane,” is this sort of text—invigorating, relentless, and charged with readiness to affect (infect?) the reader with its power and possibility. Again and again. First published in 2006, “Permeable Membrane” is a short piece capable of waking us up, of challenging our complacency, our silence, and our siloed existences. Convinced of the inseparability of art and society, poetry and politics, Rich argues for and invokes a relational understanding of language: "Art is a way of melting out through one's own skin. 'What, who is this about?' is not the essential question. 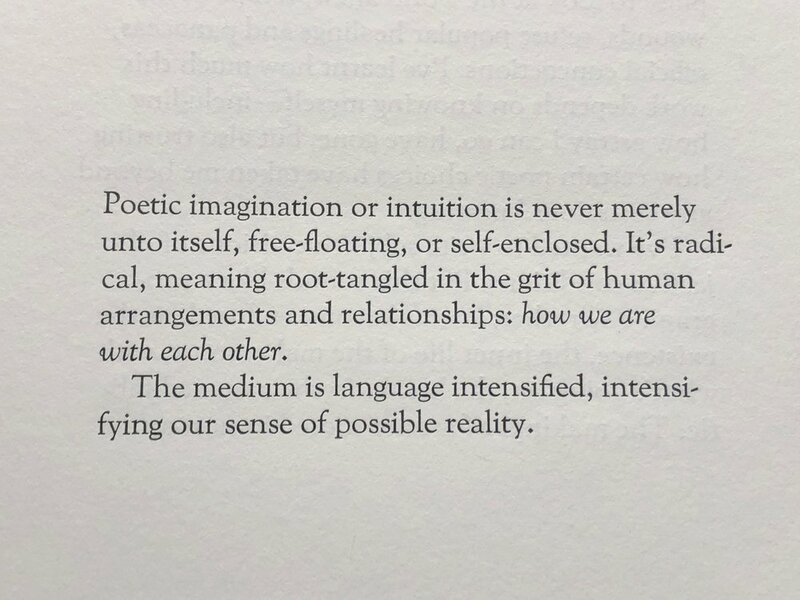 A poem is not about; it is out of and to.” As individuals and communities and a nation, we exist in a dynamic ocean of thought, culture, politics. We’re in the conversation—“root-tangled in the grit of human arrangements and relationships,” as Rich writes—whether we know it, like it, or actively participate in it or not. Rich navigates both mystery (the “ghostly” presence and process of writing poetry) and politics (solidarity movements, dictatorship, and the American political machine) with equal subtlety, drawing from sources historical and literary to illuminate the world we find ourselves in as well as some of the choices and consequences that are laid before us. With the precision and prescience of an artist who has her finger on our pulse, Rich’s essay that was first published 12 years ago reads like it hit the newsstand this morning. St Brigid Press' letterpress printed edition releases on March 8th—International Women's Day. 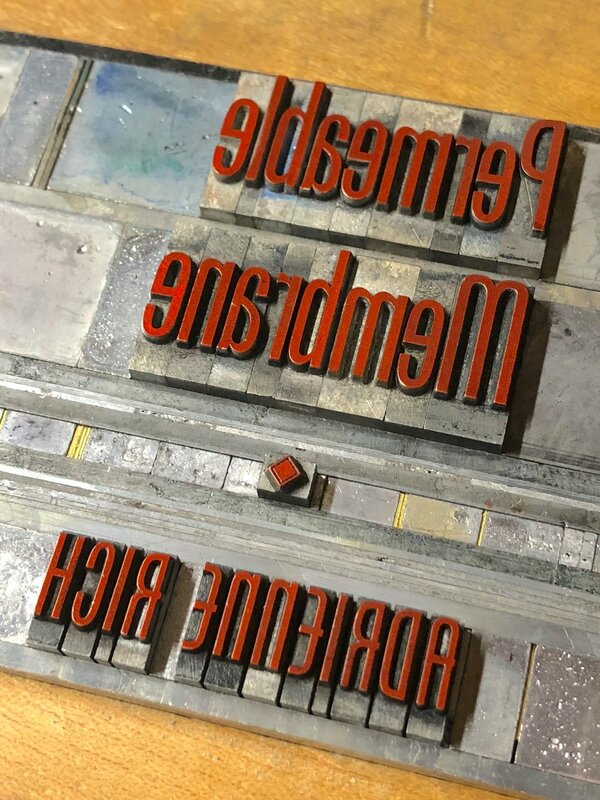 St Brigid Press' edition of "Permeable Membrane" was hand-set in Goudy Old Style type (cast by Patrick Reagh in California), printed on a hand-cranked press, and sewn by hand. Another answer is personal to me: as much as I believe in and engage with the fantastic literature that is emerging daily, I believe in and desire to offer anew the already written—works like Rich’s and Thoreau’s and King’s that for years have been leaping off pages, enlarging perspectives, and spurring creative engagement. Each time we return to these touchstones, their wisdom becomes present again, positive change for our communities becomes possible again, and we become empowered again. If you would like to order the St Brigid Press edition of "Permeable Membrane," please click HERE. Scroll down below for additional details and photos of the booklet and the process of creating it. Hand-set in Goudy Old Style metal types, with Phenix titling. 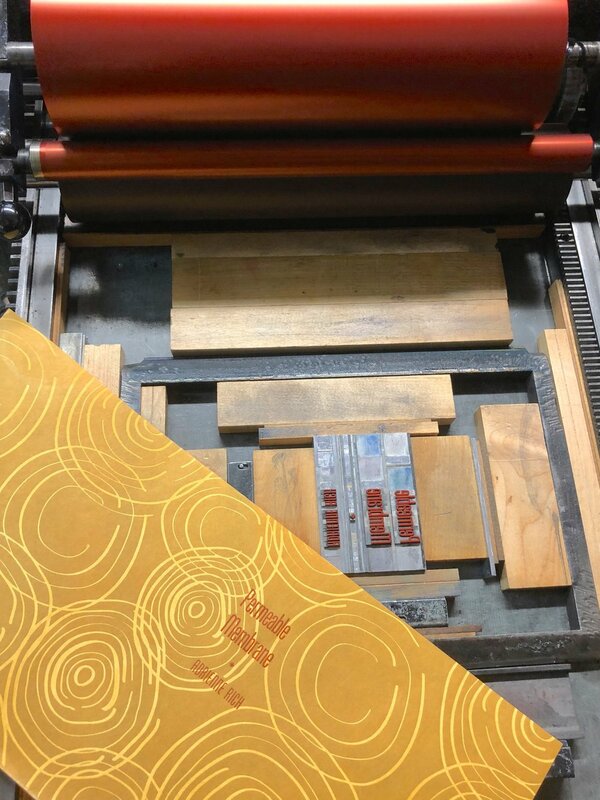 16 pages, letterpress printed on Mohawk Superfine text paper, with Thai mulberry paper jacket. Frontispiece print is a digital reproduction of an original watercolor by Nancy Maxson, commissioned specially for this publication. Hand-sewn with Irish linen thread. Limited edition of 190 numbered copies. Very special thanks and appreciation goes to our friend and collaborator Nancy Maxson, who created a marvelous watercolor painting, entitled Mirror, to accompany this edition of "Permeable Membrane." The painting was digitally reproduced on fine vellum paper at Bailey Printing in Charlottesville, and serves as the frontispiece to the edition. Thanks also to W.W. Norton & Company, Inc., for permission to reprint "Permeable Membrane." Some photos of "the making of" our edition of "Permeable Membrane": click the images to see a larger photo and accompanying text.